The proper selection of grass/legume forage species is more difficult than selection of many other crops. There are many different species and mixtures to consider. A thorough knowledge of forage species and their characteristics is required for both economical and environmental approaches to forage production. Proper selection is crucial because it will greatly influence yield, plant longevity, management that is required, and profits. To begin the selection process, edaphic, climatic, geophysical and biotic stress limitations need to be determined. Then limitations need to be categorized as either fixed or variable. Fixed limitations will exclude many species from consideration. Variable limitations may become fixed due to financial or management resources. 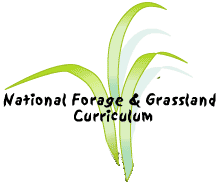 Define the needs and purposes for establishing a forage crop. A wise selection can be made after considering the previous steps and the grower's personal predisposition. Any failures should be carefully evaluated before reselection begins to determine what step in the selection model was incomplete. The goal is to match prevailing conditions with species optimums.